Others are not so coy, as local entrepreneurs create their own piece of the action. Take Joseph Palumbo, who owns one of Hunters Point's best-hidden gems - a spa and hair salon on 50th Avenue called Mind Full Peace. He supplies upmarket facial and massage products to chic spas all over the country. While Palumbo ships from downstairs, he and his family run a salon and spa upstairs. He also owns a small parking lot opposite, where he plans to construct a boutique co-op building this year. The 11 two- and three-bedroom units of around 1,400 square feet will be priced from around $700,000, and will be a two-minute walk from the water. "Most of the real-estate prices around here have doubled in the past two to three years. I've been here 40 years and I like the progress. I hope this place turns into a new Greenwich Village or SoHo," he says. Thanks Derek, that's the condo development I was talking about. Dev-Edward J. Minskoff Equities, Inc.
A suburban style office development in Queens. New York, NY -- (May 7, 2002) -- A new state-of-the-art Class-A office building is set to rise at 30-30 Northern Boulevard in Long Island City as soon as a single tenant or multiple users pre-lease all or a substantial part of the planned 655,000-square foot 15-story property, to be located just north of Queens Plaza between 40th Avenue and 40th Road. Offering brand new, high-tech office space, a five-minute subway commute to midtown, and rents at nearly a third of the price for comparable space in midtown Manhattan, the building will be developed by New York-based Edward J. Minskoff Equities, Inc. (EJME). The Insignia/ESG team of Richard Karson, Gregory P. Knoop, Eric Engelhardt, John Reinersten, Dina Raynolds, and Roni N. Horenstein has been named exclusive leasing agent, and Perkins Eastman Architects PC has been retained as project architect. "30-30 Northern Boulevard presents an unprecedented opportunity for a company to occupy a world-class office building, literally minutes from Manhattan, at prices in the mid-20's per square foot," said Mr. Knoop. "It's a very economically seductive scenario. The State and local economic development corporations are providing excellent financial incentives for companies to move to Long Island City. Transportation is already in place with subway connections to Manhattan via the E, V, N, R, W, F and 7 lines, and direct automobile and bus access via the Queensboro Bridge. Plus, the planned East Side Access project, which will enable Long Island Railroad to access Grand Central Terminal, will soon materialize." According to Richard Karson who was instrumental in establishing Insignia/ESG's Long Island City office several years ago, "This is an unprecedented and highly financially viable opportunity for a Manhattan-based company to bifurcate its operations between the City and Queens." Mr. Minskoff has plans in place and can construct a state-of-the-art building in as little time as 18 months. "Our site is not an assemblage and consists of 100,000+ square feet located within two blocks of Long Island City's major transportation hub," said Mr. Minskoff. "What's significant is that the site is close to MetLife's new premises at 27-01 Bridge Plaza. It will also benefit from all the re-development activity expected to ensue in the newly re-zoned LIC district and our tenants will be eligible for the REAP, ICIP, energy programs and rent abatement benefits available through the economic development authorities." Insignia/ESG is targeting banks, insurance companies and other institutional tenants who need staff offices, a call center, data/tech building, disaster recovery facilities, or payroll/processing location in close proximity to Manhattan. "We're marketing to tenants in midtown, situated between 34th Street and 59th Streets, who seek a cost-effective alternative to Manhattan in which to house satellite or head-office operations." Amenities at 30-30 Northern Boulevard, among others, will include access to fiber optic systems for high-speed Internet access, cable television access, state-of-the-art security systems, an institutional-quality main entrance lobby with security desk, and parking for 150 vehicles. Edward J. Minskoff Equities, Inc. owns leases, and manages more than four million square feet of commercial property. It has developed 1325 Avenue of the Americas and 101 Avenue of the Americas in Manhattan, the recently completed regional headquarters building for the Federal Aviation Administration in Queens, and owns a condominium interest at 1166 Avenue of the Americas. The company also manages the IBM building at 590 Madison Avenue, 825 Seventh Avenue and Niketown. Edward Minskoff was formerly chief executive officer of Olympia &amp; York, which developed many of the office buildings in the World Financial Center and more than 27 million square feet of office space throughout the country. Insignia/ESG is one of the largest commercial real estate services providers in the United States, with comprehensive brokerage, consulting, property management, fee development, investment sales and debt placement operations. The company operates in top U.S. markets, including New York, Chicago, Los Angeles, Boston, Philadelphia, Atlanta, Miami, San Francisco, Dallas, Phoenix and Washington, D.C. Nationally, Insignia/ESG provides services for a property portfolio spanning approximately 230 million sq. ft. Insignia/ESG also delivers advanced commercial real estate services in the United Kingdom through Insignia Richard Ellis, and in France through Insignia Bourdais, as well as through other Insignia subsidiaries in Europe, Asia and Latin America. Insignia/ESG is a subsidiary of Insignia Financial Group, Inc., a publicly traded real estate company listed on the New York Stock Exchange under the symbol IFS. nice..at least for LIC. Here's one more. The largest private employer in Queens is about to get bigger. Citigroup is erecting a new 14-story office building across the street from its landmark skyscraper on Court Square in Long Island City, moving an additional 1,500 workers into the borough, city and company officials announced Tuesday. The $200 million project should foster the neighborhood's transformation into one of New York City's fastest growing business districts, Mayor Michael Bloomberg said. "From the start our administration has followed an economic development strategy designed to create jobs throughout the five boroughs," Bloomberg said. "Citygroup's latest expansion to Long Island City does just that." He said the financial services company decided to expand in the area on its own, with no tax incentives from the city. In addition to the 475,000-square-foot building, the company will construct an underground escalator between the nearby G and 7 subway lines, improving the connection between the two lines, said Citigroup Chief Executive Officer Charles Prince. Citigroup is a global company, offering banking, credit cards, loans and insurance. It opened business in Long Island City in 1989, when it completed a 48-story skyscraper on Court Square housing 4,800 employees. Prince said the company should break ground in 2005 on the new facility and hopes to occupy the building by the end of 2006 or early 2007. The new office, which is being designed by Manhattan-based Kohn Pedersen Fox Associates, will accommodate management workers, Prince said. When it is completed, Citigroup will have a total of 6,300 workers in Queens. The mayor said it already is the largest private sector employer in the borough. Queens officials praised the expansion. "Long Island City is truly coming into its own and we are - by the way - going to give New Jersey a run for their money," said Queens Borough President Helen Marshal, referring to the rivalry between the state to the south and the neighborhood to draw financial jobs from Lower Manhattan. Community Board 2 voted earlier this month to approve a business deal that could clear the way for as much as 3 million square feet of new commercial office space along Queens Plaza, another milestone in the business development that is reshaping Long Island City. Under the agreement, Tishman Speyer Properties, whose other holdings include such iconic city locales as Rockefeller Center and the Chrysler Building, would receive a 99-year lease on city-owned land currently occupied by the Queens Plaza Garage at Jackson Avenue and an adjacent lot, said Jeremy Smith, a project manager with New York City Economic Development Corp. The board had previously approved a land-use request for the project in 2001. Under the business agreement approved on Nov. 4 in a 31-1 vote with two abstentions, Tishman Speyer, which has buildings in nine cities across Europe and the Americas, would have to build on the Queens Plaza Garage site by no later than 2015, Smith said. During construction, the 1,150-space Queens Plaza Garage, which currently houses 180,000 square feet of commercial office space, would be demolished and replaced with similar on-site parking, as outlined in the agreement. Some residents had expressed concern about the temporary loss of parking, but planners said the majority of the garage's users are actually commuters from Long Island who drop off their cars at Queens Plaza before hopping a train into the city. "We are very excited about building a building in Long Island City," Tony Mannarino, a representative of Tishman Speyer told the community board. "We have been looking for opportunities to do something outside Manhattan." Long Island City is fast attracting the businesses and office space that are turning it into one of the city's most important financial centers. The MetLife building and Citigroup's 48-story Court Square skyscraper call the area home. And Citigroup, which already houses 4,800 employees in the borough, is slated to break ground on an additional 14-story, 475,000-square-foot office complex in 2005. Tishman Speyer's proposed project would dramatically increase the amount of commercial office space available in the area. As part of the deal, the developer also would be required to spend $1 million to market and publicize the area over a period of 10 years, Smith said. "One of the major advantages to the commercial space being located in Long Island City is it's basically an extension of Midtown," said Michael Reale, a project manager with the Long Island City Business Development Corp. "It's right over the 59th Street Bridge." But booming development also is forcing planners to perform a balancing act, Reale said. "Obviously, it would be great to have more commercial space but also at the same time to try to attempt to retain the manufacturing part of Long Island City which is basically part of the area's heritage," Reale said. "It's kind of juggling both interests at the same time." Portions of Long Island City were rezoned several years ago to accommodate further commercial and residential development. Zoning regulations allow for the construction of as much as 3 million square feet of office space between the two lots Tishman Speyer is looking to develop, said Suzanne Halpin, executive vice president of Rubenstein Communications, which is handling public relations for the developer. It was too early to speculate what shape the buildings would take, Halpin said. But the project has the resounding support of the EDC. "One of the exciting things about this is Tishman Speyer is a world renowned developer," said Melanie Lenz, the EDC's vice president for Queens Real Estate. "Something on this site will happen soon. It will happen with the right resources. And it will happen in the right way." Janelle Patterson, a spokeswoman for the EDC, said the development plan has not been finalized and must still be approved by the Borough Board and the EDC board. Final approval could come as early as February, she said. April 13, 2005 -- TISHMAN Speyer Properties, which controls a handful of back office development sites in Long Island City, is negotiating with the city's Dept. of Transportation to develop 600,000 feet on Jackson Avenue. The site would be the first of five buildings on the block planned for development by TSP, which along with the Modell family owns properties that total more than 3.5 million square feet. During a luncheon speech yesterday to the Young Men's and Women's Real Estate Association at the University Club, Rob Speyer would only say the firm was beginning to negotiate with an unnamed tenant and that they would be launching a marketing campaign to the industry over the next few months. He described the buildings as "totally Class A, perfectly efficient...that will have people feeling like they are in a building in Midtown." Raul De Armas of Moed De Armas & Shannon is the architect and the rent would be in the mid-$20s. "What is happening today is a movement forward to make this the next important business district in New York," said Rep. Carolyn Maloney, who took to the roof of the Long Island City municipal garage at the corner of Queens Plaza South and Jackson Ave. on Friday afternoon to make her announcement. Plans call for the garage to be torn down and replaced with a multiuse commercial/residential structure. "What we are really doing with this grant today is building the economic development foundation for future economic development and growth here in western Queens and to improve the quality of life for Long Island City residents," said Maloney. Plans for the plaza area call for a section now used for parking at the northeastern end to be made into a park. They also propose a swath of that property along Queens Plaza South be used for green space and a reconfigured roadway. Accepting an enlarged check from Maloney were city Transportation Commissioner Iris Weinshall and Amanda Burden, director of the Department of City Planning. "This project will make this very important transportation hub user friendly for bicyclists, pedestrians and motorists," said Weinshall. "All of us feel this is one of the greatest business districts. We are one subway stop from Manhattan. We have every advantage here in Long Island City. We have culture. We have business. We have transportation. It is fantastic," said Burden. But "it has never been a great gateway," she added. The new funding, she said, "will make such a difference to pedestrian safety, to amenities, and will really [boost] this business district, which we think has the greatest potential in all of New York." The principal objective of the project is to reduce traffic congestion and improve air quality along Queens Plaza by encouraging mass transit and alternative forms of transportation, such as walking and bicycling. The project, already underway and expected to take about five years, will develop a design for new pedestrian and biking amenities and will include new and increased lighting, landscaping, street furniture, crosswalks, public art, and directional signs. It'd be nice if they built the design that won the competition. The much-watched saga of the fate of four smokestacks atop a former power plant in Long Island City, Queens, has a resolution: they are coming down. Despite a neighborhood campaign to preserve the smokestacks, they will make way for a developer's glass and aluminum tower, which will form a residential complex when combined with the 1909 power plant, the onetime Pennsylvania Railroad Power Station. "We had no choice but to look for a different design," said Cheskel Schwimmer of CGS Builders, the developer. Mr. Schwimmer said he originally had hoped to incorporate the smokestacks into his design, constructing a glass cube between them. "But the city did not approve it," he said. "We had to look at other options." In the neighborhood, where the smokestacks' plight has sparked debate for months, Mr. Schwimmer's opponents are not pleased. "I think it's sad," said Paul Parkhill, co-director of the educational group Place in History, who participated in a postcard campaign seeking landmark status for the plant. "It sort of underscores the fact that the city doesn't do a good job of protecting industrial buildings, especially in the outer boroughs." Nevertheless, some residents were not particularly disheartened. "There are mixed feelings in the neighborhood between newer residents and people who are second or third generation here," said Joseph Conley, chairman of Community Board 2. "The artists, the newer arrivals in the neighborhood, they tend to be the preservationists." But any dispute has been silenced by the scaffolding covering each of the stacks. At last look, one was already halfway gone. More photos of the demolition. 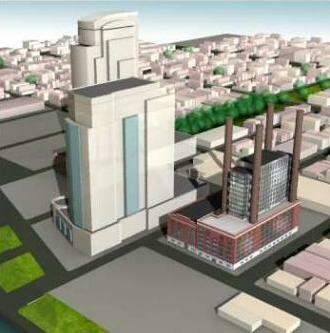 LIC smokestacks site eyed for luxe apts. Last edited by Derek2k3; May 14th, 2005 at 09:43 PM. So a 4 to 5 story aluminum and glass addition. The four smokestacks atop the old Schwartz Chemical factory are being demolished in order to construct an addition to the building. In the latest conflict between development money and aesthetics, money carried the day. 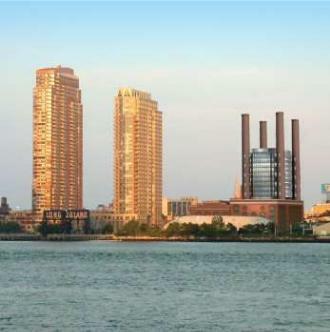 Four iconic smokestacks that have defined the Long Island City cityscape for nearly a century will be taken down in the next several months. A demolition permit was issued to the contractor on March 28th, and the smokestacks have been covered with scaffolding to facilitate their dismantling. The developer, Cheskel Schwimmer of CGS Builders, is turning the former power plant into luxury condominiums. The site has extra floor-area ratio that Schwimmer would like to take advantage of. But in order to do that he would have to demolish the smokestacks to add extra units to the top of the structure, or get a variance to build within them. Schwimmer said in the end, it was just not feasible to go through the variance process. “It was a much better design to keep the smokestacks,” said the project’s architect, Karl Fisher. “But he didn’t want to wait.” The variance process requires hearings with the community board, borough president and then the final decision rests with the city’s Board of Standards and Appeals. Schwimmer had been meeting with the Department of Buildings for the last several months to see if a design could be worked out that would satisfy the zoning laws and still use the maximum floor-area ratio. No agreement could be reached. After the smokestacks are removed, a four or five-story addition will be added to the top of the building that will cover almost the entire area of the roof. The Long Island City waterfront has been in the midst of a large development push. New tower projects, like River East, have followed on the heels of the successful Avalon and Citylights buildings. The neighborhood’s zoning designation was recently changed from light industrial to mixed use including residential, commercial and light industrial use. Indeed, the smokestacks are a vivid reminder of the neighborhood’s industrial history. Paul Parkhill, director of Place in History, a non-profit community planning organization, started a postcard campaign to get the four chimneys landmarked when they heard of the developer’s plans. “It’s usually an uphill battle,” he said of his chances at the time. Although there are some vocal proponents of the smokestacks, there was hardly a groundswell of support to save them. Many locals pointed out they were in disrepair and are looking forward to the goods and services that follow an increased residential population. “Upward and onward,” urged Iorlanao. Too bad they decided not to keep the smokestacks, the cube in between the stacks sounded really interesting and would’ve made the building an instant landmark, a designation this up and coming neighborhood lacks. On that note the sleek and modern renovation of Queens Plaza is apparently not going to be built either, its ashame because landmark projects like this are needed to spur the greater redevelopment and attract the interest of businesses and residents. LONG ISLAND CITY, NY-Reckson Associates Realty Corp. has inked a deal for the 1.4-million-sf tower at One Court Square here for $470 million, inclusive of transfer taxes and other transaction costs. The 50-story class A tower will remain occupied by its seller, Citibank NA, under a 15-year net lease. "One Court Square’s attractive price per square foot offers the potential for material asset value appreciation as the surrounding market continues to develop,“ says Scott Rechler, Reckson's president and chief executive officer. “It is our intention to capitalize on this acquisition to pursue additional value-added opportunities in the Long Island City submarket." Tod Waterman, executive vice president and managing director of Reckson's New York City division, says the acquisition complements its 90-property, 17.7-million-sf portfolio. Citibank plans to develop a 475,000-sf, $200-million office expansion adjacent to One Court Square. Reckson officials believe the Long Island City submarket will benefit from the strength of Midtown Manhattan's class A office market, the continuing trend of regional decentralization in the New York Tri-State area and the significant infrastructure and zoning upgrades planned for the area. In 2001, the New York City Department of City Planning identified central Long Island City as a growth area with significant potential for office, retail and residential development and the city council adopted the initiative to rezone 37 centrally located blocks in the area. The zoning was expected to facilitate commercial development at increased densities as well as allow new residences to mix with commercial and light industrial businesses. In another large Long Island City transaction, New York Blood Center inked a long-term lease for 76,000 sf at 45-01 Vernon Blvd., John Maltz, president. and Gary R. Blum, director of conversion development at Greiner-Maltz, the brokers who represented the ownership of NYBC, say the deal will not only bring jobs to the neighborhood, but validates the area as a prime commercial destination at a time when most properties are looked upon solely for their residential conversion value. NYBC first inspected the property in the summer of 2004 through their exclusive broker, CB Richard Ellis. Negotiations continued through to mid-April, due in part to the detailed requirements of NYBC. Reckson expects to generate an initial unleveraged cash flow yield of approximately 6.5% and a GAAP NOI yield of approximately 6.8% on the total anticipated investment, while the net lease is in effect. The Citibank lease contains partial cancellation options effective during years six and seven for up to 20% of the leased space and in years nine and 10 for up to an additional 20% of the leased space, subject to notice and penalty. Closing is expected sometime this month. To facilitate the transaction, Reckson has obtained a $470-million unsecured bridge loan facility. The cube between the stacks design. It's listed under "The Power House." Last edited by Derek2k3; May 14th, 2005 at 09:40 PM. Oh cool Derek2k3!! Good find... Thanks! Here are a few shots of the smokestacks being taken down from Forgotten-NY. It's quite depressing to see the smokestacks going down. Here's a link to the Forgotten-NY story on the smokestacks.